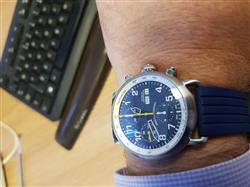 I’ve purchased an AGL Blue Dial Chrono Automatic from Ferro & Company. I like its design. The watch comes with a Valjoux 7750 movement which keeps its power for at least 48 hours. I hope, that Ferro & Company will start selling watches with a Valjoux 7751, which is a little bit more complicated movement, however it has more features. The service I got from Ferro & Company was great. Was skeptical of a Kickstarter watch, but once I saw it included the Valjoux 7750 movement, I was all in. I did not have a blue face watch in my collection, and opted for this. 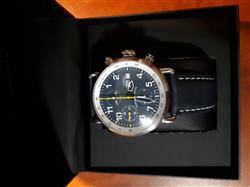 It is a beautiful watch. The crown has a vintage feel to it, and the dual push buttons are the perfect size for this watch. The hours (12 hour format), minutes (30 minute counter) and small seconds dials are elegant, along with the yellow seconds hand. Not sure of the font/type set used for the hours, but it is perfect. The skeleton hands allows the wearer to see the face and all of the dials. The back of the watch is just as impressive, allowing the wearer to see the jewels and rotor. Just remember to have a watch winder handy. This was the second watch I'd ever bought on Kickstarter...and quite an investment sight unseen. But when it arrived, I was blown away by the obvious quality of the piece...the case is immaculate...beautifully finished and substantial. The design is spot on, and people regularly comment what a beautiful watch it is and want to know the brand...they're usually surprised when they discover it's not one of the 'bigger' luxury brands. What I particularly like are the skeleton hands, which are a really nice touch. I like that Ferro is a small brand run by a friendly team who clearly work hard at keeping their customers happy. Overall I'd say it's an elegant piece, it has a great movement so I am confident about reliability and also timekeeping...I'd recommend anyone to guy a Ferro. Absolutely delighted with my Ferro watch. Keeps great time and looks amazing. The watch is very well made. I am a big chronograph fan and this is a new piece to my collection.